Brody or Josh Brody, formerly known as BarkSanchez, or Bark the Shark is a Super Smash Bros. Pikachu main from Baltimore. Josh Brody, formerly known as BarkSanchez, entered the scene with his brother, Darkhorse, as a random player found at a bar tournament in Baltimore. After teaming with Shears and VGBootcamp to build Smash 64's first well known weekly event, Brody quickly established himself as a rising star, notching wins against Nintendude and LD. His breakout performance came at Smash of Ages 2015. Following a win against B-rex, Brody pulled off a monumental upset against KeroKeroppi, one of the strongest players in North America. This is still considered one of the biggest upsets in the history of competitive Smash 64. In his next match, BarkSanchez almost pulled off another upset against JaimeHR, one of the top Mexican players in a close 2-1 set. In loser's, he defeated Eggmode before narrowly losing a 2-1 set against Kyle Tree, one of the top players of the West Coast. These spectacular performances against incredibly talented players notched BarkSanchez a 7th place spot. BarkSanchez also fared quite well at Operation Desert Smash, facing off against many of Los Angeles's top players. He took down Madrush in winner's bracket, before being sent to loser's after a close set with Tacos, a perennial top 3 player. In loser's, BarkSanchez took down Sotoh, earning him the chance to exact revenge on Kyle Tree. His next match was yet another Smash of Ages rematch, against Jaime. Streaky play following two unfortunate mistakes forced by Wispy, Dreamland's only hazard, gave Jaime the edge in yet another close set. Bark is notorious for his ability to adapt, and play up to top level talent very early in his competitive career. At Frame Perfect Series 2, he was able to take a set off of Wizzrobe, earning him a place in Grand Finals against SuPeRbOoMfAn, where he took a game and got 2nd. At CEO Dreamland, Bark continued a successful 2017 with a 3-2 upset against Alvin in set 1 of Grand Finals (although Alvin mainly sandbagged). However, he could not hold onto the win later in set 2, where he lost 1-3. At the end of 2017, he announced the decision to abandon the gamertag BarkSanchez, opting to continue his competitive career under his own name. 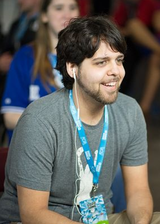 Despite a difficult 2018, Brody has over the years established himself as one of the best players in the United States, with wins including Alvin, Wizzrobe, Isai, Prince, Kerokeroppi, Tacos, and many more top level players. This page was last edited on March 10, 2019, at 22:32.